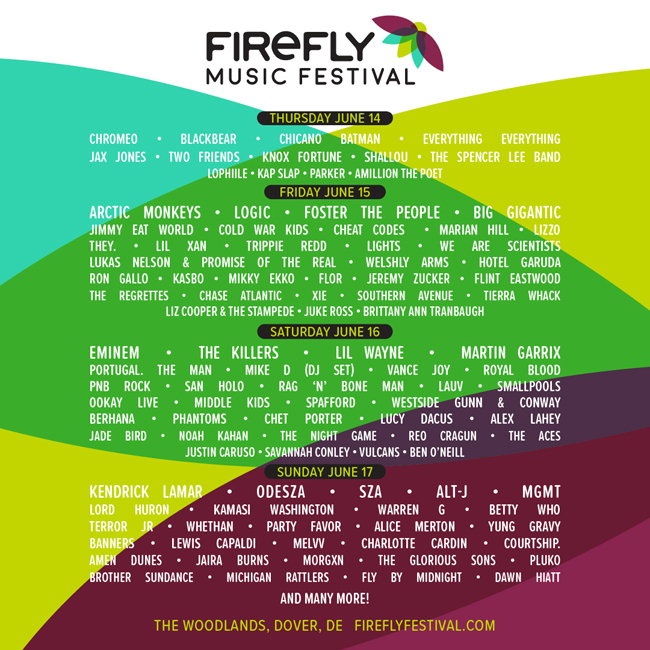 Home » Features » Firefly Music Festival Announces Daily Band Lineup’s! Firefly Music Festival Announces Daily Band Lineup’s! (TRR) Firefly Music Festival, the east coast’s largest music and camping festival, announced their daily lineups. Single day passes will go on sale Friday, April 13 at 10 a.m. ET with prices increasing Sunday, April 15 at 11:59 p.m. ET. // Prices will increase to $119 Sunday, April 15 at 11:59 p.m. ET. Firefly Music Festival, the east coast’s largest music and camping festival, is returning to The Woodlands for the seventh year June 14 – 17, 2018. Along with headliners Eminem, Kendrick Lamar, Arctic Monkeys, and The Killers, the lineup also features ODESZA, Lil Wayne, Logic, Martin Garrix, SZA, alt-J, Portugal. The Man, Foster the People, MGMT, Mike D (DJ Set) and more. Tagged Arctic Monkeys, eminem, festival, Firefly Music Festival, Kendrick Lamar.